ad usum externum, ad us. exter. Short for advertisement: Jim's employer placed an ad in the paper for additional workers. 1. To find the sum of numbers or quantities: Shane and Clara tried to add the total number of people who were at the party. 2. To go on to say or to write more: Helen said goodbye and wanted to add that she had a pleasant visit with Darren and Yvonne. 3. To join one thing to another so as to increase the number, quantity, or the importance of something: Lynn decided to add a new wing to her house. Francisco and Thelma placed an ad in the paper because they wanted to add a pool to their yard; however, after they decided to add all of the expenses, they found it much more feasible to invest in a wading pool instead. 1. A traditional saying expressing a common experience or observation; a proverb: The village elder used many adages to illustrate his stories about the people who have lived in the area. 2. A saying that sets forth a general truth and which has gained credit through long use: Benjamin Franklin, an historical figure in United States History, often used a simple adage to illustrate his talks; for example, "Early to bed, early to rise, makes a man (person) healthy, wealthy, and wise." 3. 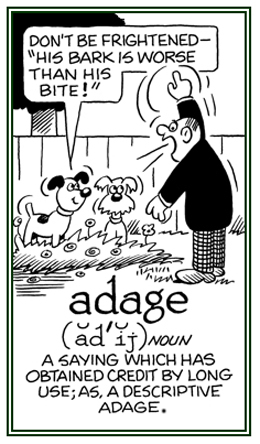 Etymology: formed Latin adagium, "proverb, saying" from ad, "to" + agi, "to say, to speak". © ALL rights are reserved. Showing page 5 out of 12 pages of 168 main-word entries or main-word-entry groups.